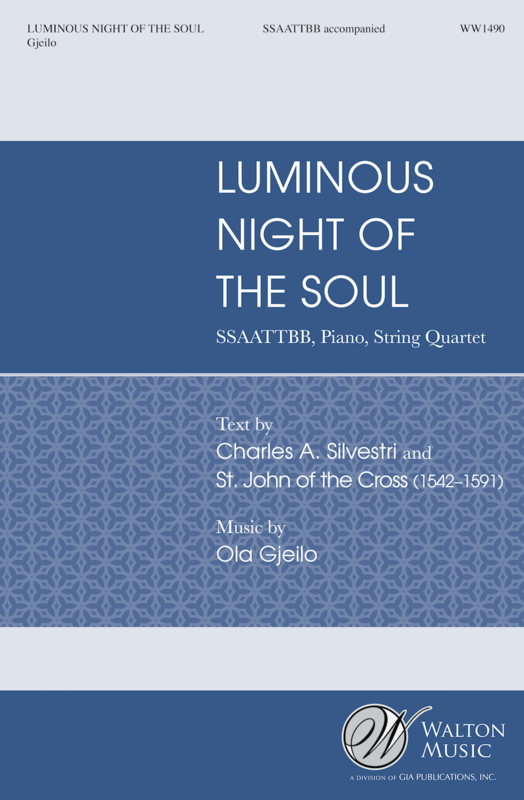 Set to a new text by Charles Anthony Silvestri as well as a stanza from St. John of the Cross’ poem used in the predecessor to this piece, Luminous Night of the Soul is the sequel to Dark Night of the Soul, which was published in 2011. Both works are independent pieces that can be performed separately, but they are also conceived as two movements of the same work. Dark Night and Luminous Night are influenced by a wish to feature the piano more heavily in choral music, not as generic, unassuming accompaniment, but as an equal partner to the choir, aided and supported by the string quartet. Though most of all, I just wanted to attempt to find ways to compose lush, warm, symphonic-sounding music, while still only scoring for five instruments, in addition to the choir.